and approach understanding man and his universe. Sound in general is a basic fact which follows mankind since some hunderd thousand of years. which are at least complete different to the subject of sound. measuring of the totality of sound in his organised form of music. In this detailed and well documented article, Dr. Fazli Arslan describes the work of one of the most important figures of the history of Middle Eastern music, Safi al-Din ‘Abd al-Mu’min al-Urmawi (d. 1294). One meets his name in the introductions to most of the books written in the field of the theory of Eastern music. Al-Urmawi analyzed thoroughly the Greek sources and the works of Muslim scholars such as al-Kindi, al-Farabi, and Ibn Sina. He studied the practical music of his time scientifically and systematized it in his Kitab al-adwar (The Book of Musical Modes) and in his main treatise al-Risala al-sharafiyya fi al-nisab al-ta’lifiyya (The Sharafian Treatise on Musical Proportions). The contribution of Safi al-Din al-Urmawi to the theory and the practice of Arabic music are of tremendous importance, as it occupies a valuable place in the chain of theoretical works in the history of music theory starting with al-Kindi. Al-Urmawi studied the sciences at the Mustansiriyya school in Baghdad and was well known as a celebrated calligrapher and writer of literature. He was also a good physicist. In practical music, he was a performer of the ‘ud (oriental lute) and invented two musical instruments. The sound system that he systematized, known as the “Old Orient sound system with 17 notes”, was considered by modern critics as one of the best sound systems. It is thanks to this system and other achievements that he was claimed as Zarlino of the Orient. Many Muslim authors who wrote about the theory of music in subsequent centuries relied on his works in music theory, Kitab al-adwar and al-Risala al-sharafiyya. Among these we may mention Qutb al-Din Mahmud al-Shirazi (d. 1310), Abd al-Qadir b. Ghaybi al-Maraghi (d. 1435), Fath Allah Mumin al-Shirwani (d. 1486), Muhammad b. ‘Abd al-Hamid al-Ladhiqi (d. 1494) and Alishah b. Haci Buke (d. 1500). The treatise al-Risala al-sharafiyya consists of five discourses under different headings. Its content is analysed in this article. A special focus is laid on the mathematical fundamentals of music in the second, third and fourth discourses of the book. The parts of the works of al-Kindi, al-Farabi, and Ibn Sina that benefited to Safi al-Din are also indicated. Finally, the traces of al-Sharafiyya are tracked by showing references to it in some works written in later centuries, in order to emphasize the impact of the book on the subsequent studies and the innovations it brought. 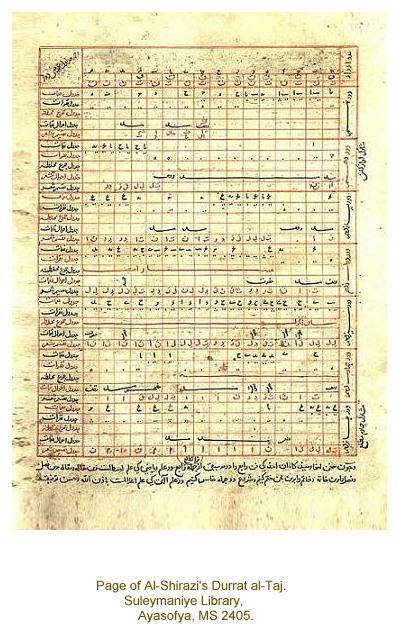 Safi al-Din studied the ratios between the numbers very systematically, named the intervals established with these ratios, classified them, and explained the consonant and dissonant intervals in detail. After al-Farabi, the tetrachord divisions had never been examined in such a detailed way in any adwar. Safi al-Din showed all possible divisions and pointed out the most consonant of these. He mentioned the tetrachords with four intervals and pentachordal kinds and explained the consonant ones. Some writers following him avoided this topic as it is complicated and full of details and did no more than following the same route as Safi al-Din which they called their master and praised him. Safi al-Din al-Urmawi benefited from several sequencing forms of tetrachord, pentachord and tanini intervals while he was arranging two octave ranges. While forming one and two octave ranges, he arranged the intervals of tetrachord and pentachord in several ways and formed the maqams with the consonant ranges appearing after this work. In addition, he mentioned some topics such as the determination of 17 sound ranges, common tones of scales, transposition, performing of an instrument, the order of accords, and the performance with several accords and compositions. The examination and naming of the maqams in Kitab al-adwar and al-Sharafiyya of Safi al-Din were achieved for the first time. In al-Sharafiyya, Safi al-Din arranged 63 ranges with tetrachords and pentachords, and he produced 18 maqams out of them and showed the scales of 12 ones in the tables by adapting them into 17 tones/notes. Until the end of the fifteenth century, there were no great changes in the classification and naming of the maqams Safi al-Din did. Having a great knowledge over theoretical music in his age, Safi al-Din surveyed almost all the topics in al-Sharafiyya with a clear and understandable language and style. With all these features, the Sharafiyya treatise stands as a valuable work supplying substantial contributions which should be noticed by everybody writing over theoretical music in the Islamic heritage of the past. This entry was posted on Friday, March 15th, 2013 at 15:25	and tagged with cytopicus, ram51, Safi al-Din al-Urmawi and the Theory of Music and posted in Music Theory, Oriental Studies on Alpha-numeric Representations of Music. You can follow any responses to this entry through the RSS 2.0 feed.